Are you religious or are you a Christian? There are thousands of religions in the world, but there is only one Christianity. Religion from a Christian perspective and viewpoint depends upon the doctrine that you hold to, whether it is Mormon, Baptist, Methodist, Protestant, Episcopal, or Catholic or any number of other doctrines in the world. Religion can be anything that you might want to worship and there are enough religions in the world to prove that, and yet other than Christianity none of them have a living Savior! Their founders are dead or imagined, made up in the minds of men, and yet each of those religions may have thousands or millions of followers, some may have billions of followers. The point that I am making is this…has anyone thought about which way, which path or road should you be following? I am not trying to cause any more divisions between churches or denominations. What I am trying to point out is that true Christians exist in all denominations but there are also many who think that they are believers when they are not. This graphic is seen more clearly if you open it in a new tab of your browser. Many things have happened in our world to cause this such as airline travel and other technological advances. 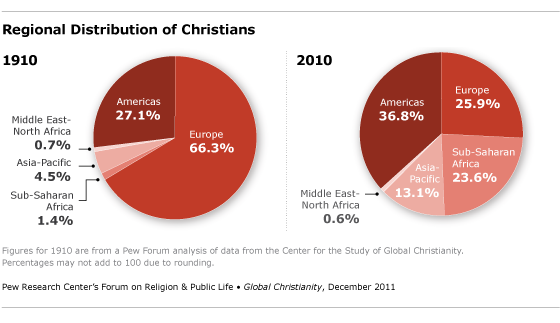 The point is that there are more people claiming to be Christians but there are also more people who claim to adhere to other religions or even no religion at all. What, if anything, can we do to help others see that they need Jesus? If people have made up their minds, there is little that you and I can do. It wouldn’t matter if you were the greatest evangelist in the world for some people, they have their minds made up and nobody is going to change their view except God Himself! If God has determined that they are going to be used by Him for some purpose, then He will get their attention eventually. What about those who are modern day Pharisees? They see themselves as Christians and don’t believe that they need salvation but are not followers of Jesus. I am not trying to be a judge of their faith, but if the fruit is not visible in their lives, then what are they? Usually their reasons go something like this: “I have always been a member of this church, since my youth. I have served as a teacher in Sunday school and on various committees in the church as well as giving my tithes on a regular basis. How dare you question my faith!” Well, as a comical story I heard once went, “I could live in a garage all of my life but I still wouldn’t have four wheels and an engine!” You cannot absorb a faith and live it out for others to see just because you have been in a church and exposed to preaching for years. You have heard the message, but the message has not penetrated your heart! We are accountable to God for the light that we have heard and read and lived by whether we have taken it into our heart and our life or not. Because of this there will be many who will be astonished on that day when Christ says, “Depart from me, I never knew you.” Don’t let that day be the day that you hear those words, give your heart to Jesus while there is life in your body so that you can serve Him until He calls you home! Then you will hear, “Well done my good and faithful servant”. And if you are, by what or by whom did you come by this justification? You did not get through any work or anything on your own, so what makes you think that you are justified? The article in question is that of justification by faith alone. To Luther, whether this doctrine was believed and preached or not was the basis by which we judge if it is a true church! A church ceases to be a church when it ceases to declare that sinners are reconciled to God by no other way than by faith. It is our faith which defines us as Christians because without it, we have no hope in Christ nor are we justified in Him. The doctrine of justification by faith alone is essential to the gospel. The gospel ceases to be ‘good news’ if it ceases to declare that Christ alone has accomplished our salvation. We are trying to mix our own brand of law with the Grace that comes from the belief that we are supposed to have in Christ. Theologians have always understood that when we say we are justified by faith alone, we are really saying we are justified by the work of Christ alone. The work that Christ did on the cross was all that needed to be done, we cannot add anything to it. We are unable to add anything to the perfect sacrifice which Christ gave for us. That’s why this doctrine is so important. If we try to contribute anything more to our salvation than simply believing what Christ has already done, we cheapen His work of grace and declare it insufficient. We are calling Him a liar by trying to add to His work, because He said “It is finished!”, and with those words Christ proved that nothing else was needed except for us to accept it and believe in the saving grace that Christ provided for us through His sacrifice. Paul himself was Saul at first, a Pharisee and a zealot for the Jewish faith. He tried to eradicate the Way as it was called at first but Jesus met him on the road to Damascus and it changed him forever. He became one of the most influential apostles of the first century. Our faith is the path, and it must be in Jesus and the work that He alone accomplished on the cross. Our justification has always been in Him and through Him and what He did, it has never been based on anything that we can do because nothing that we do is holy or acceptable to God unless we have the holiness of Christ living in us and through us by faith in Him. The only possible way that we have to be justified in our Christian walk if through faith in Christ and in His sacrifice for us on the cross. If we don’t believe in that, then we might as well decide to be an agnostic and not believe any of the Word of God. Because dis-belief in any part of God’s Word nullifies all of it. Just like not believing in any part of any contract, or disagreeing with any part of it makes the entirety of the contract useless. Do we REALLY need motivation to Pray? In the situation depicted here in this picture, prayer and running faster would be helpful! But what about our everyday lives? 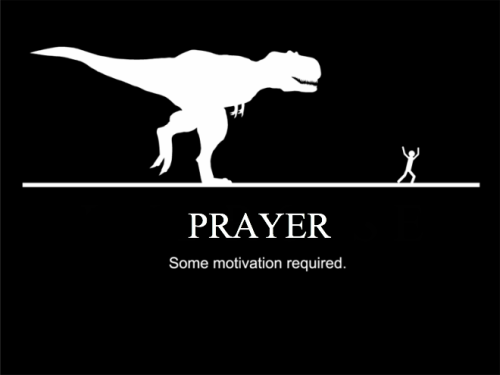 Do we really need motivation to pray? It seems that many people do need a crisis of some kind to motivate them to truly pray to their Father in Heaven. But, why is that? Shouldn’t we be praying to Him anyway? He is the Author of life and the Creator of everything so why not pray to Him? Don’t you believe that He could take care of whatever situation you might be in? Granted, He may do so in His own time and not as immediately as we would like, but don’t give up on God! He has never given up on anyone and He doesn’t until it is too late for them to give their lives to Him. It is our individual choices which take us places that we enjoy or not. Our choices, not someone else’s, are the ones that we will have to account for when we face God one day. Have you considered that today? Have you thought of what you have done or said that you haven’t asked Him for forgiveness for? You can’t hide any part of your life from God, no matter how much you may want to. He knows all about each of us, regardless of which continent you live on or how far you may be from the nearest cell tower! God doesn’t need cell coverage to find you because He never lost you! He has always been near you, patiently waiting for you to ask for Him to come into your life and help you get things straitened out. I know that there are many of you who read this that think “My life doesn’t need to be straitened out!”; if that is true, what is working so perfectly in your life that nothing needs to be fixed? Please let the world know how you got everything figured out so we can all enjoy this freedom! There are many who think that they have it figured out, but they are really fooling themselves. Everyone has problems of one kind or another, some are worse than others but I don’t believe that there is a person on this planet that doesn’t have some problems or at the least one problem. Life just isn’t that easy or pleasant. Even if you have enough money that you can buy anything that you could want, without asking “How much?”; there are still taxes to pay, rent, maintenance fees for cars, houses, apartments, etc. Life just doesn’t let you have it that easy without some problems. Unless, you are one of those who is off the grid, no cell, no internet, no TV, paid cash for a small house and all that you have to worry about is utilities and food. So even with that, you still have “bills” of a sort; of course you could grow your own veggies, and unless your home is a solar powered one you still have to pay for electricity. Living on earth is just not that forgiving as far as problems are concerned, although living off the grid entirely doesn’t sound too bad come to think of it! Giving your heart to Jesus doesn’t fix any of these problems either. As a matter of fact, some problems may get worse especially if you tell others about your Savior and can’t keep it to yourself! We were commanded to do this, so why should you! That is why this blog exists, so that people who are searching for some of life’s answers can find them. I don’t have those answers, but God’s Word does and all you have to do is read it. Live your life according to Scripture and in awe of our God and Creator, because if He had not made our home we wouldn’t have such a perfect place to live. I know that many of you don’t have a perfect place, but in comparison to the other planets in our solar system, earth is as perfect for us as it gets. God loves you, each and every one of you because He created you and placed you exactly where He wanted you to be! Give your life to Jesus, pursue Him as you would a lover, learn about Him from the Word of God. When you have done these things, He will give you the peace that you cannot understand and that you have longed for all of your life. You will also be assured of a place in heaven forever and not punishment in hell. During our lifetimes we have all started a conversation, or a question with “Dad? Can I….” It is not a bad way of starting a conversation actually, because it shows that you want Dad’s input or his permission in some area of your life or for something that you would like to do or even as a preamble to asking for something like a gift, whether it is for your birthday or Christmas (if you celebrate it). What I like to hear from my son is that he would like to do something with me. It doesn’t matter what it is. If I can do it, I will go anywhere and do anything with him as long as I feel that I am wanted…needed in his young life. The reason that I say this is because there are so many father/son relationships which are strained or even broken for whatever reason. Kids need their fathers. They need them to be in their lives, maybe not 24/7 but they need them nonetheless. It doesn’t matter for what reason, it can be for any reason but children, boys and girls, need their Dad. I barely had one when I was growing up because of a divorce that happened when I was only five years old. Of course, I thought it was something that I did, and something that I could fix. I found out later that wasn’t the reason, that I was not even part of the reason for it. I grew up angry and resentful because of it, mainly because I was so young that nobody thought it was a good idea to tell me exactly why this had happened when I got old enough to understand. Dad’s usually are good at helping kids understand things, especially when they are around. My point in this is that our father, our Dads are important and should be in our lives, not only when we are young but when we get older as well. I know of many who are taking care of their Dad now because he is older, because he needs his children. Is it too much to ask of us as children to be there for the man who was there for us? If your Dad wasn’t around while you were growing up, maybe you can get together now. Try not to hold a grudge against him, there usually was a good reason for his absence. Our Father, the One in Heaven, would also like to be in your life. The difference between our Heavenly Father and our Dad that we have here on earth is that we must choose to have a relationship with Him. In some kids lives, they may need to choose to have a relationship with their earthly father as well, but that relationship is important too. God wants a relationship with each of us and He is always with us. His presence in your life can be felt and known at any time regardless of where you are. The reason behind His presence in your life is because He wants to be, but you have to choose to allow Him into your life. In order for us to have a real relationship with God, we have to come to Him through Jesus. When we do that, we can have a relationship with God forever, not just while we are alive here but when our body dies, we will wake up in His presence. Isn’t that awesome! That doesn’t mean that we will be in “church” forever. We will be worshiping Him but in other ways, we will be serving Him in whatever ways that we can. The difference in Heaven will be that we have the knowledge to do what needs to be done and we will have eternity to do whatever there is that needs doing. By choosing to have a relationship with Jesus, you get a relationship with the Father too. He has loved each of us from the beginning, not of our life but the beginning of time itself. He has known you from long before you were ever born or even before the world, earth, was created for us to live on. His love, His compassion for us is so far beyond our comprehension that it is hard to explain. As the Scripture says, “my ways are higher than your ways, and my thoughts are higher than your thoughts”, God is simply saying that He is perfect in His knowledge of all things above and beyond what we can know. He is not bragging, it is just the truth! This Father’s Day, think about your father, your Dad and then really think about having or starting a relationship with God, your Father in Heaven. Life is too short to waste it on stuff, our relationship with our family, both here on earth and the family that we have in Heaven, is far more important than is given credit in our culture today. Give both of your Fathers your attention so your relationship with them doesn’t have to end. Think about it. Have you every thought seriously about the awesome gift that we have in being able to know and be known by the Creator? The One Who spoke everything into being before He personally formed mankind from the dust of the earth! But, you know what else is fantastic? He actually came to earth to die for our sins, not just the sins of those in Israel or those in the world at the time that He was born, but for us and all of us in the past two thousand years as well as those until the time that Jesus comes back. If you have given your life to Christ, Who is the Creator, you are not condemned because your sins have been forgiven already, all that you have to do is believe in Him and the sacrifice that He gave for you. Our Creator is the only Savior or God Who has come and sacrificed Himself for all of us! Muhammad, Krishna, Buddha, whichever one you wish to name, none of them sacrificed themselves for their believers. No man-made god has ever done anything even close because they can’t! The only real God is God. Our Lord did so much for us and yet there has never been any other that can do what He has done in the past or is doing now. We have God’s grace given to us every day because we have everything that we need to live. I don’t mean that we have all of the money that we need or a big house or a fancy car, but we have air, water, food and a place to live! God gives us our talents as well as our jobs so we are able to live our lives and provide for our families. God, His Son Jesus and the Holy Spirit all work in tandem as One. They have different functions, but they are God yet God the Father is in control. He knows when things will happen, how it will happen and who it will happen to. God loves us and allows us to have our choice in our lives and He will not force His will on us at all, but we have to choose to follow Jesus and believe in His sacrifice for our sins in order to be saved and go to Heaven. Belief in God doesn’t do it. Satan believes in God, he knows God and Jesus but he won’t serve them and won’t bow to them. Knowledge of God and His Son, Jesus, is not enough! You have to give your heart to Jesus and believe that He died for your sins and choose to serve Him.